For those who work in forestry, a best professional chainsaw is an absolute must-have for success out in the field. You’ll need the best professional chainsaw that can push through even the most difficult forestry projects and has the durability to last for years to come. Your professional chainsaw is a big investment, so it’s important to choose the best one for your needs. In this article, we’ll review the best professional chainsaws on the market and help you make the best purchase for your career. There are many things to consider when shopping for a professional chainsaw. The first is the type of work you will be doing. Chainsaws come in a variety of different sizes and power levels to be used on different types of trees and plants. If your work involves maintaining landscaped trees, for example, you’ll likely need a much smaller chainsaw option than someone who works with dense forests. It will help to know the average size of the plants you are working on because you can then purchase the appropriately sized bar for your needs. You’ll also want to consider the safety, ease of use, and maintenance requirements of the chainsaw. Even for experienced professionals, chainsaws still pose some level of danger because they are so powerful. It’s important that your chainsaw has safety features designed to minimize kickback and prevent injury to you during use. Chain brakes are the most important feature for this, as they stop the machine immediately if the tip of the bar makes contact with something and could cause kickback. You should also look for a chainsaw that is easy to use. Many gas-powered chainsaws are difficult to start, so it’s important to look for one that is designed to make this process as painless as possible. It’s also important that your chainsaw has hand grips that are comfortable so that you can easily maneuver the tool as you are working. The level of maintenance required is also something that’s important to consider. Chainsaws require frequent oiling to stay functioning at high levels. Many chainsaws have systems that automatically oil the chain for you, making them very easy and convenient to use. You should also make sure that the chain is easy to tighten – many chainsaws have knobs on the side of the device to make this process quick. You’ll also want to consider the quality of the chainsaw. Since you’re purchasing this chainsaw for professional use, you will need it to last you for years. These high-quality chainsaws are usually a big investment, so it’s important that you find one that gives you the best possible value for money. The chainsaw should be made of durable parts, and it’s always helpful if the manufacturer offers a warranty and accessible maintenance services as well. When shopping for a professional chainsaw, you’ll want to avoid small devices that are designed for home use, as these likely won’t last you as long or be as effective for the type of work that you do. It’s important to evaluate the power of the engine when shopping for a chainsaw. The size and power of an engine are measured in cc, and the higher the number, the more powerful it is going to be. There are many different chainsaw models out on the market today, but only some are suitable for professional use. Here are our reviews of the top professional chainsaws. 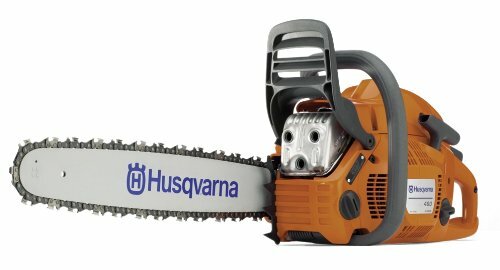 Husqvarna is one of the leading brands in the chainsaw industry, so it makes sense that this chainsaw is one of the most ideal for professional use. It has a huge 20-inch bar and 60.3 cc engine that aren’t for the faint of heart but will definitely provide you with the power to get virtually any job done. It also has a three-piece crankshaft to prevent damage even on the toughest of trees. However, just because this chainsaw is so big doesn’t mean it’s difficult to use. 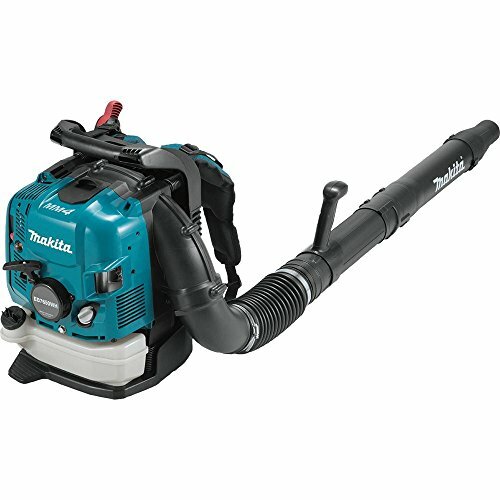 It has several features that make it stand out, including a side chain tension knob for easy access, an automatic oiler with three settings, and an air filter that’s simple to remove and clean. It’s also CARB compliant, so you can use it without guilt about fumes. It’s also very affordable for a chainsaw of its size. The only downside is that because it is very large and heavy, it may be difficult to carry around for those of smaller stature. It is very large and powerful, so it can cut large trees easily. It has several automatic features that make it convenient to use. It is affordable for such a large chainsaw. The large size makes it difficult to carry around. 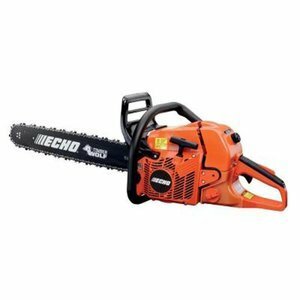 The Echo brand produces some of the strongest chainsaws on the market today, so it makes sense that professionals love them. It has a 59.8 cc two-stroke engine that is very powerful and also relatively easy to start, with a decompression valve that takes some of the pressure off. The bar is 20 inches long, so it can cut through large trees and branches. It is very easy to access the gas tank, spark plug, and air filter, which makes maintenance very easy. It also has an easily adjustable chain oiler for high performance. Additionally, it has a highly sensitive chain brake for safety. This saw is also very reliable, and many customers have found that they’re last for an extremely long time. The parts are heavy-duty and are designed for use over an extended period of time. The engine is powerful, but still easy to start. The whole machine is extremely durable and made of high-quality parts. It can be difficult to find replacement parts for this saw should you need them. While slightly smaller than some of the other chainsaws on this list, this model is ideal for professionals because it provides the perfect balance of power and maneuverability. It has an 18-inch bar and a 51cc two-cycle engine, and it’s ideal for a range of different forestry and landscaping projects. The bar is designed to prevent kickback, and the handles minimize vibration, so it’s both safe and comfortable to use. It also starts quickly due to an electronic ignition, which gets the engine going quickly with just a few pulls. It is well-constructed with durable parts, so you’ll get your money’s worth out of this investment. It has an adjustable automatic oiler, and it comes with oil so you don’t have to make a separate purchase. Overall, this is a great gas chainsaw that is easy to use for long periods of time. The only downside is that the chain does require regular sharpening, which does add some extra work for the busy professional. This model can easily be the best professional chainsaw. It is an ideal size and power level for most professional projects. It is very easy to start and keeps going for a long time. As with most of the products in the Remington line, it is very durable and well-crafted. The chain requires frequent sharpening to work well. This professional-grade chainsaw cuts smoothly and is very easy to use, making it perfect for long-term use. It has a 50.1cc engine and a 20-inch bar. 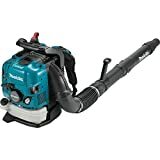 It has an automatic adjustable oiler, bumper spikes, and a sprocket nose bar, all of which make it easier to get nice, clean cuts and keep the chain in good condition. The engine is designed to consume minimal amounts of fuel, which is not only good for the planet but good for your wallet as well. It starts very easily with a half throttle choke and decompression valve, so you can get to work right away. 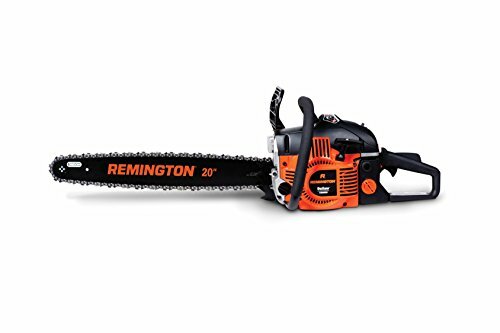 It also comes with an outstanding 7-year consumer and 2-year commercial warranty, which is not often provided for chainsaws such as this one. It is lighter than many other professional grade chainsaws, so you may need to replace parts or do more maintenance on it than you would for other saws. It is very easy to handle and starts quickly. It consumes minimal amounts of fuel and it relatively quiet for a chainsaw of its size. The lighter weight means it may not be as durable as other similar chainsaws. There are many amazing chainsaws on the market, but not all are suited to professional use. The chainsaws reviewed here provide the durability and performance that you need to succeed as a professional. We think the best professional chainsaw is the Remington RM5118R because of the outstanding performance and durability.